The AnyGetter aims to allow you to get virtually everyting. Let us assume that you want to first get the related Many-To-One relation (in this case an object). After that, you want to grab the field collection (fc), get the second item (not shown) and display the `works' field. Please be aware that for fieldcollections there is a special operator which does exactly something like that! Array Type: If true then the getter will be called on all all child result values and the result will be passed up as array. Return last result: Return the last non-empty result even if a child returns an empty result. Forward Attribute: By default, child operators use the original object. 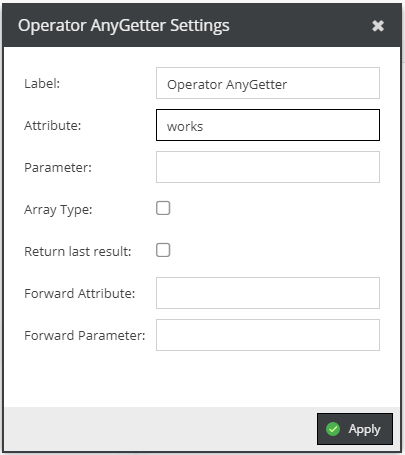 By defining a Forward Attribute you can replace the "target" with the result of the forward attribute's getter. Forward Parameter: Same as above.